The U.S. Department of Labor Women's Bureau turned 90 years old on June 11. (Did you know we had a Women's Bureau? Me either.) It was created in 1920, the year women got the right to vote. The bureau's mission is to "formulate standards and policies which shall promote the welfare of wage-earning women, improve their working conditions, increase their efficiency, and advance their opportunities for profitable employment." That's a jarring statement (what about non-wage-earners?) until you consider it's part of the Department of Labor. So, as you might imagine, the bureau has a big focus on jobs and job-related issues, including equal pay. Take a look around the bureau's website some time; it looks like they're doing good things for working women. 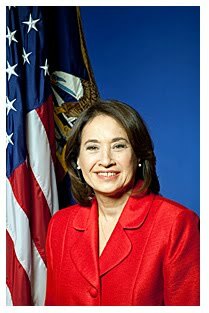 It's lead by Sara Manzano-Díaz, who was just appointed by President Obama and confirmed by the Senate in February. Throughout our history, American women have played a vital role in the growth and vitality of our Nation's economy. They have tirelessly balanced responsibilities to work, family, and community, strengthening our economic leadership and enriching our national life. Today, there are more women in America's workforce than ever before, yet they still face significant obstacles to equal economic opportunity and advancement. Recognizing the challenges women confronted in the workforce, the Congress established the Women's Bureau in the Department of Labor on June 5, 1920, 2 months before women gained the right to vote. For the past 90 years, the Women's Bureau has been a champion for working women nationwide through its commitment to advancing employment opportunities, improving their working conditions, and helping them achieve economic security. As women surged into the labor force, the Women's Bureau tackled the barriers to their economic advancement. Early in its history, the Women's Bureau advocated for the successful inclusion of women under the Fair Labor Standards Act of 1938, establishing minimum wages and maximum working hours. The Bureau also played an instrumental role in the passage of the Equal Pay Act of 1963. And the first law that I signed as President -- the Lilly Ledbetter Fair Pay Restoration Act --builds upon these vital protections to ensure people subjected to discrimination have better access to a remedy. Equal economic opportunity and wage parity are not simply women's issues -- they are American issues. As a Nation, we must recommit to the enduring vision of the Women's Bureau and work to support all wage-earning women. With the hard-fought progress of the past as a foundation, we can build a better and brighter tomorrow, one in which our daughters have an equal right and opportunity to pursue the American Dream. NOW, THEREFORE, I, BARACK OBAMA, President of the United States of America, by virtue of the authority vested in me by the Constitution and the laws of the United States, do hereby proclaim June 11, 2010, as the 90th Anniversary of the Department of Labor Women's Bureau. I call upon all Americans to observe this anniversary with appropriate programs, ceremonies, and activities that honor the Bureau's history, accomplishments, and contributions to working women.